[294 Pages Report] The antimicrobial packaging market size is estimated to grow from USD 7.28 Billion in 2015 to USD 10.00 Billion by 2021, at a CAGR of 5.54%. The antimicrobial packaging market is growing rapidly in accordance with the growth in the packaging market, globally. Antimicrobial packaging is widely used in the food industry as a result of the rising consumer demand for products that are perishable, preservative-free, and minimally processed, and also due to the need to increase the shelf life of the products. This application is projected to foster the demand for antimicrobial packaging solutions during the forecast period. 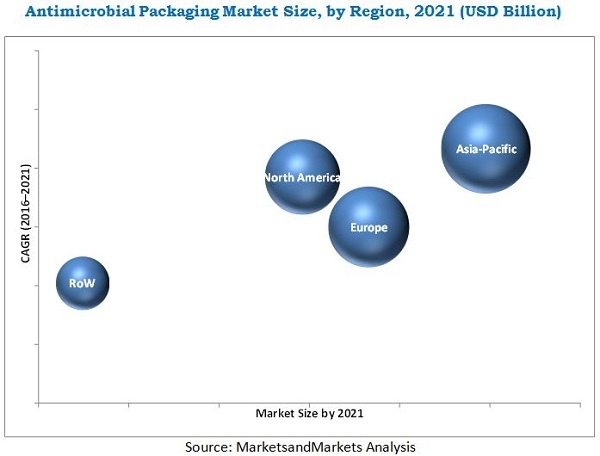 The report aims at estimating the market size and future growth potential of the antimicrobial packaging market across different segments such as base material, pack type, antimicrobial agents, technology, end-user industry, and region. The base year considered for the study is 2015 and the market size is projected from 2016 to 2021. Factors such as growing demand in Asia-Pacific, growth in the food & beverage and healthcare sectors, and growing health-related awareness among consumers are the major drivers of the antimicrobial packaging market in the next five years. The base year considered for the report is 2015, whereas the forecast period considered for the report is 2016–2021. The market ecosystem includes various stakeholders involved in the supply chain of the antimicrobial packaging industry starting from raw materials suppliers, research & development, manufacturing, and the assembly team. After this, the marketing and sales of the finished products take place which is only possible if an efficient distribution channel is developed. Finally, the end-products are made available to the consumers. The global market for antimicrobial packaging is dominated by players such as BASF SE (Germany), The Dow Chemical Company (U.S.), Mondi Plc (South Africa), PolyOne Corporation (U.S.), Biocote Limited (U.K.), Dunmore Corporation (U.S.), Linpac Senior Holdings (U.K.), Microban International (U.S.), Oplon Pure Sciences Ltd. (Israel), and Takex Labo Co. Ltd. This report estimates the size of the antimicrobial packaging market in terms of volume (kilotons) and value (USD million). In this report, the market has been segmented broadly on the basis of base material, technology, antimicrobial agents, pack type, application, and region. The market drivers, restraints, opportunities, challenges, and product price trends have also been discussed in detail. MarketsandMarkets projects that the antimicrobial packaging market size will grow from USD 7.28 Billion in 2015 to USD 10.00 Billion by 2021, at an estimated CAGR of 5.54%. The rising concerns toward food wastage, growing consumer awareness about health-related issues, rising consumption of products with shorter shelf life such as meat products, and increasing demand by various end-user industries such as food & beverage, healthcare, personal care, consumer goods, and agricultural products are the major factors driving the growth of the antimicrobial packaging market. Additionally, with rapid urbanization and demand for better quality products across the globe, there is a rapidly increasing need for antimicrobial packaging. Food & beverages is projected to have the largest market share and dominate the antimicrobial packaging market from 2016 to 2021. Healthcare is the next application to play a key role in changing the antimicrobial packaging landscape and is projected to grow at the second-highest rate during the forecast period. The segmentation for this report is based on base material, technology, antimicrobial agents, pack type, application, and region. Pouches are projected to form the fastest-growing pack type in the antimicrobial packaging market as it can be used to pack various types of products belonging to different industries. The next pack type that has the largest market share is carton packages as they are widely used across the food & beverages industry. Other types of pack types are trays, bags, cups & lids, cans, and blister packs. The market share of organic acids is the largest as per antimicrobial agents. This is closely followed by bacteriocins which has the highest growth rate. The other type of antimicrobial agents that are widely used are enzymes, essential oils, metal ions & oxidizers, gas, fungicides, natural extracts, and antibiotics. Antimicrobial packaging solutions are used in various industries due to their utility. The antimicrobial packaging solutions offer various advantages such as maintaining the quality of the products, increasing the shelf-life of the commodity, and keeping them fresh. These are some of the main reasons which have led to the increase in the share of antimicrobial packaging in the packaging industry. The major industries having a healthy demand for antimicrobial packaging are food & beverages, healthcare, personal care, consumer goods, and agricultural products. The food & beverages industry, for a long time, has been the major contributor to the rising demand for antimicrobial packaging. But in recent times, this has been closely competed by other industries such as healthcare. Asia-Pacific is projected to have the largest market share and dominate the antimicrobial packaging market from 2016 to 2021. Asia-Pacific offers potential growth opportunities, as developing countries such as China and India are projected to be emerging markets, making this region also the fastest-growing market for antimicrobial packaging. The growth of the antimicrobial packaging market in this region is propelled by factors such as the growth of the food & beverage, healthcare, personal care, consumer goods, and agricultural products industry. Also growing population and economic development are other factors. However, due to fluctuations in the raw material prices, stringent compliance to regulations, and need for continuous technological advancements and research & development, the organizations are exposed to potential risks and are restraining the growth of the antimicrobial packaging market. The global market for antimicrobial packaging is dominated by players such as BASF SE (Germany), The Dow Chemical Company (U.S.), Mondi Plc (South Africa), PolyOne Corporation (U.S.), Biocote Limited (U.K.), Dunmore Corporation (U.S.), Linpac Senior Holdings (U.K.), Microban International (U.S.), Oplon Pure Sciences Ltd. (Israel), and Takex Labo Co. Ltd. 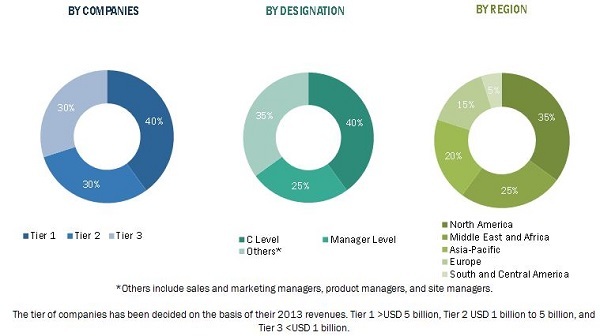 These players adopted various strategies such as agreements, acquisitions, and new product developments to cater to the needs of the antimicrobial packaging market. 12.2.9.1 Controlled Release Packaging Projected to Be the Fastest-Growing Segment in the U.S.
12.3.4.3.1 Controlled Release Packaging Projected to Be the Fastest-Growing Segment in the U.K.
14.10 Oplon Pure Science Ltd.
14.11 Takex Labo Co. Ltd.